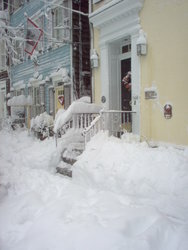 The historic Annapolis Inn was built by Mr. Thomas Rutland in the 1770s and was later sold to Dr. James Murray, a Scottish immigrant who became the preeminent physician in Annapolis during the Revolutionary War period and who also became the physician to the Revolutionary Army and eventually to President Thomas Jefferson. 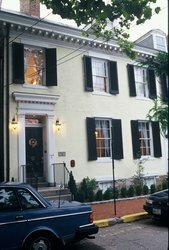 The historic house has been archived as The Dr. James Murray House, a magnificently imposing Georgian townhouse located in the heart of the downtown district of historic Annapolis, Maryland. In the late 1848, the house was purchased by Mr. James Iglehart whose family made major modifications to the house making it a landmark in its own right. Mr. James Iglehart bought the property in 1848 and made significant changes to the design. He installed stone mantelpieces, window architraves, and other woodwork in the Greek Revival style. Mr. Iglehart created double parlors between the front and rear rooms. Staying at The Annapolis Inn allows you not to just walk through history but truly savor it. Our three suites, The Murray Suite, The Rutland Suite and The Iglehart Suite have been named after these initial three prestigious owners and Annapolis families here at the historic Annapolis Inn. Discover what top publications are saying about our historic and romantic inn. Capital Gazette has graciously included our inn in their latest shortlist of indulgent luxuries in Annapolis, Maryland. Spot our historic bed and breakfast on Newsday’s enumeration of romantic weekend getaways by Long Island. Or watch a video to hear more about us! The integrity of the historic beauty of The Annapolis Inn has not only been respectfully honored and preserved over the centuries but has been updated with the exquisite European fineries of 18th Century that were not available to colonial America at the time. The living room and dining room, stately aristocratic salons decorated to create a breathtaking and enticing ambiance of magnificent 18th Century English and French period furnishings, are irresistibly captivating and inviting. The rooms cast a majestic spell of overwhelming enchantment and fascination drawing your attention to every detail that insists on being admired. Gaze upon the Swarovski crystal chandeliers, the European tapestries, the original oil paintings, onyx urns, oriental rugs, sterling silver tea set, and French antique clocks. Above, the original 18th Century crown molding, a combination of plaster and horse hair, bestows a vision of wealth and allurement with its ornate rosettes exquisitely adorned in gold leaf. What an immediate way of making a guest feel special! 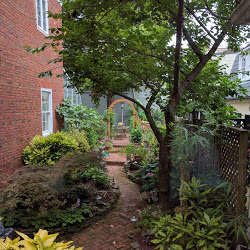 The historic Annapolis Inn has the unique balance of comfortable luxury within a beautiful and elegant setting that is just one block from the City Dock of Annapolis, Maryland. Take a stroll through our private garden. As seen during the winter months.